Some perspective on the "Canadian Renaissance"
As I’ve given various speeches over the last year, it has become clear to me that very few Americans are aware of the extraordinary recovery Canada has achieved since the mid-1990s. When I bring it up, most people seem surprised that Canada could have gone from a laughing stock to the envy of the developed world in just a decade. But, actually, 10 years wasn’t the true recovery period. And that was my big surprise from reading The Canadian Century . The reality is that Canada achieved stunning progress in a mere three years. Further, this time frame was consistent at both the federal and provincial levels. Hay: "Not all is lost"
His message for Americans is: "Not all is lost, there is hope." If Canada can go from a basket case and enormous deficits in the mid-1990s to the relative fiscal health today, so can the United States. All it takes is a certain amount of willingness to take some fiscal pain. Having lived in both countries, I feel uniquely qualified to comment on Hay's message. Just as America isn't Japan in the Lost Decade(s) parallels, America isn't Canada either. While it is true that the Canadian Liberal government, under prime minister Jean Chretien and finance minister Paul Martin Jr. (who later became prime minister), moved from deficit to surplus in the 1990s, it was aided by substantial tailwinds. Don't forget that the US federal budget was in surplus at about the same time during the Clinton years. Much of the US surplus was helped by capital gains during the Tech Bubble of the late 1990s, which is not likely to be repeated. Hay's essay implies that all it takes is the political will and discipline to take some pain, whether it's in the form of higher taxes and/or reduced government spending, and all will be well. I believe he understates the problem. Canada and the US diverged substantially during the Bush II years. While Canada maintained its fiscal discipline on a relative basis, the Bush II Administration embarked on two spending initiatives that made the federal budget dive into deep deficit waters. The first was the tax cuts. With another election coming up and contentious debate on both sides of the issue, it would be inappropriate for a Canadian resident to wade in on that debate and I'll leave it up to the American people to decide on whether a continuation of the Bush II tax cuts is a good idea. The second, of course, was ramp-up in military spending in the post-9/11 era. Being in government is about making choices. In a democracy, it is up to the people to make choices through their elected representatives. From a strictly fiscal viewpoint, the wild ramp-up in military spending makes no sense. American troops are in Afghanistan, Iraq and the Gulf as a direct result of the 9/11 attacks. The cumulative cost of the Afghan and Iraqi campaigns now exceed $1 trillion. It makes no fiscal sense to spend $1T in response to the actions of a small group of men, spending roughly $100,000 on a mission that flew civilian airliners into buildings. Nor does it make fiscal sense to propose spending $1.2 billion in aid because one guy tried to get on an airplane with a bomb in his underwear. A strategy of consistently outspending your enemy by 10 million to 1 will make you the loser over the long run. Of course, in a democracy you get to make choices of how to spend money. If a continued military commitment is the choice the citizens of a country chooses to make, then let the People express its will. Paul Krugman once characterized the federal government as a giant insurance company with an army and I agree. Some really hard decisions have to be made and the choices are stark. In simplistic terms, Americans need to decide between their pension (Social Security) and health care or the essence of their post WW II identity (world prestiage and status) by standing down from their far flung military outposts around the world. It isn't as simple as firing a few civil servants - Tea Party supporters take note. Also see the New York Times article entitled "As the GOP seeks spending cuts, details are scarce". * Canadians may be getting overly smug by taking the victory lap and cartoons like this, which reflect popular sentiment, may be the top tick for Canada. Both the Bank of Canada and most recently the Toronto-Dominion Bank are warning about excessive consumer debt - and we know what happened to the American consumer in the last downleg. The chart below shows that the sector had broken down from a key relative resistance level (red line), bounced off a Fibo support level and rallied to test the (red) relative resistance level. Should the sector weaken further on a relative basis, it would be bad news for the bulls. When I looked at the relative performance of the Materials sector, which is a measure of the reflation trade, the Materials sector approached a relative resistance level and backed off. It's now testing a relative uptrend line. Similar to the Financials relative performance chart, should Materials fail at the relative uptrend, it would be another indication that this bull move is over, at least for the duration. Instead of analyzing the Materials sector and if we zoomed in on the golds, the relative chart tell a similar story. The group remains in a relative uptrend but it has retreated and is now testing the uptrend line. The behavior of some of these critical sectors and groups in the next couple of days will be important signs for the health of the bull. Michael Pettiis had an interesting, but politically difficult solution to the economic problem of the imbalance between China and the United States (which is why he put as a Modest Proposal in the Swift manner). Pettis suggests a "New Deal" for both China and America. Instead of the Chinese wildly spending on excessively infrastructure, which is creating an asset bubble in China, why not spend it on American infrastructure? Over time, better American infrastructure will raise productivity and stimulate US consumer spending, which benefits China. It's a win-win. What Pettis is proposing is the Macquarie solution for America. A number of years ago, Macquarie was known for raising funds and securitizing infrastructure projects, e.g. toll roads, bridges, etc. If the state of Illinois wanted to build a new highway, or if California wanted to upgrade one of its ports, or construct a desalination plant, it could create an authority to build that highway and then collect the tolls. The tolls would then be used to finance the construction. In effect, the Pettis proposal would change Chinese investment in the US from debt (Treasuries) to equity (toll roads, etc.) What's more, a for-profit construction authority would pay more attention to the economics of the project, which would mitigate much of the pork that goes on in many of these endeavors. It would create also American jobs in engineering and construction - another win-win. It's a very intriguing idea. In the highly polarized, politicized and politically correct climate that is America, it is difficult to have a rational conversation about some topics, such as how to heal the rift with the Muslim world and community. Perhaps the first step is to try to relax and laugh about it. Consider these two offerings from America's closest allies, which could never be produced in the United States under the current environment. The first comes from the UK and it's a film called The Infidel, which is about a middle-aged Muslim who discovers that he was adopted and that he is actually Jewish (see the trailer here). The second, from Canada, is a long running TV series called Little Mosque on the Prairie, about a small group of Muslims who get together and run a mosque in a small prairie town (by renting the hall from the local Anglican parish no less). See the first episode part 1 here, part 2 here and part 3 here. Go take a look. They are both hilarious. The stock and commodity markets have been rallying based on expectations that the Federal Reserve would implement QE2, aka printing money. I have written about the risks to QE2 here and here and I don't want to beat a dead horse. Despite the general market strength, stocks fell off yesterday based on fears that the mortgage foreclosure mess would seriously impact the financials. Others have covered the mortgage foreclosure mess much better than I have so I won't repeat the analysis (see Felix Salmon's comments here and Barry Ritholz at The Big Picture here and here). The risk here is that, if all this mortgage paper is shown to be defective, then someone, somewhere, is going to take a big haircut. Most likely, the haircut is going to show up somewhere in the financial system. I don't want to be overly alarmist because we really don't have a good handle on the magnitude of the problem. I do have a foggy memory that back in 2008, it was the combination of bad paper and excessive leverage caused a financial panic. Panics are the financial equivalent of fires and central bankers act as fire fighters. During these episodes, the central banker can inject liquidity into the financial system. However, if a bank is sunk by bad loans (or bad mortgage paper that it's holding), then its assets are less than its liabilities, or deposits, and it is deemed to be insolvent. Insolvent banks can't be saved by additional liquidity, they need equity injections. Just remember this: QE2 can only supply more liquidity to the system, not solvency. Should we experience another solvency crisis in the financial system, then no amount of Fed Treasury purchase can save the system. Something else would have to be done, e.g. another TARP. The market is already starting to price in the solvency risk in the system. A look at the relative performance chart of the Financials against the market shows that, despite the stock market rally, Financials remain in a relative downtrend and continue to underperform the market. In fact, the sector is now testing a relative support zone, with little downside protection should relative support fail. The behavior of the Financials highlight the risk to the system. This sector bears watching as a barometer of the robustness of continued strength of the market rally. Will QE lead to class warfare? Further to my last post about the risks of quantitative easing, I saw a couple of warnings from the IMF that are worrisome. First, they warned that the risks to financial stability remain high. Moreover, they indicated that Basel III won’t ward off another financial crisis. Policy makers appear to be in my-only-tool-is-a-hammer-so-every-problem-is-a-nail mode. The consensus solution of choice are further quantitative easing, competitive devaluation and trade protectionism (mostly directed at China). For those who have the money to burn, demand is moving increasingly toward things that cannot be produced. Land, art, rare wines and Super Bowl tickets are being bid up to unthinkable levels. The major economic pastime that remains to differentiate the rich from the rest of us is picking new stuff to throw into the fray. The latest one is scholar stones from the Sung Dynasty. All that money has to go somewhere. But that only leads to a transfer of income from one well-to-do pocket to another without generating any production. Sadly for those grounded in the middle class, this means more of these things are moving out of reach. But no matter. It all seems silly and abstract to most of us, like the amusing eccentricities of the English upper class a century or two before. Most probably Beijing will do the same thing Tokyo did after the Plaza Accords and Beijing did after the renminbi began appreciating in 2005. It will lower real interest rates and force credit expansion. I noted previously--and it is now commonly accepted--that monetary policy can affect systemic risk through a number of channels.First, monetary policy has a direct effect on asset prices for the obvious reason that interest rates represent the opportunity costs of holding assets. Indeed, an important element of the monetary transmission mechanism works through the asset price channel. In theory, an increase in asset prices induced by a decline in interest rates should not cause asset prices to keep escalating in bubble-like fashion. But if bubbles do develop, perhaps because of an onset of excessive optimism, and especially if the bubble is financed by debt, the result may be a buildup of systemic risk. Second, recent research has identified possible linkages between monetary policy and leverage among financial intermediaries. It is conceivable that accommodative monetary policy could provide tinder for a buildup of leverage and excessive risk-taking in the financial system. What happens after the next Crash? We learned the hard way in 2008 and 2000 that asset bubbles end quite badly. If Basel III doesn’t ward off the next Crash, what happens then? 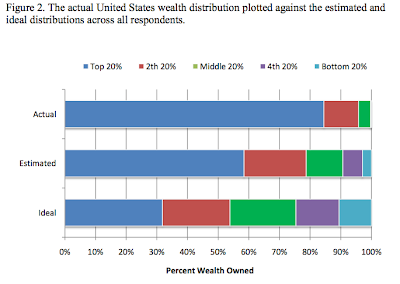 Michael Norton and Dan Ariely wrote a short paper entitled Building a better America, one wealth quintile at a time that surveyed Americans about their perception of wealth distribution and contrasted it with the actual figures. Not many Americans realize that the 80-20 rule applies here. 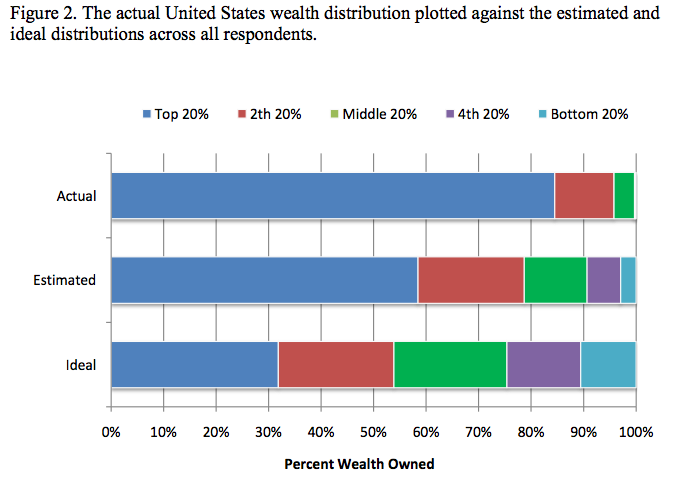 Roughly 20% of the population have 80% of the wealth, which is not only very different from the estimates, but different from the popular ideal. Add to the mix with American net worth is already down 26% and the fact that the rich don’t feel rich anymore. At what point does that lead to class warfare? The United States has been living a lie. As a nation, we have been kidding ourselves, repeating myths, hoping that if we say something enough times, it will become reality — no matter how untrue. The credit crisis and now foreclosure debacle has revealed to anyone who cares to look what we have sought to ignore: That the past decade has been based on a set of fundamental beliefs that are intrinsically false. Its time for an intervention. We need someone to force us to stop hitting the bottle, lose the bimbo, skip the dessert cart, visit the gym. Its time to stop bullshitting ourselves about Financial Engineering, and face both the Truth & Consequences of our legacy financial system. There will come an event that will - probably very quickly - bring forth the unintended consequences of all this unprecedented action, and the Something will be reviled instead of embraced. I feel like I am watching a horror movie and the creepy music is starting to build...and it's building to a crescendo. But what will be the trigger for the collapse? The time may finally be at hand when the imbalances created by Bretton Woods 2 now tear the system asunder. The collapse is coming via an unexpected channel; rather than originating from abroad, the shock that sets it in motion comes from the inside, a blast of stimulus from the US Federal Reserve. And at the moment, the collapse looks likely to turn disorderly quickly. If the Federal Reserve is committed to quantitative easing, there is no way for the rest of the world to stop to flow of dollars that is already emanating from the US. Yet much of the world does not want to accept the inevitable, and there appears to be no agreement on what comes next. Call me pessimistic, but right now I don't see how this situation gets anything but more ugly. Although asset prices may be buoyant at the moment, there are other risks ahead. Competitive devaluation is an inherently unstable system. Someone must lose their share of world trade. And a policy of boosting exports can all too easily turn into a policy of blocking imports. Investors should be prepared for this possibility. Don't say that this is another black swan event and no one foresaw this. You have been warned. I read an interesting article last week in the New York Times entitled Scientists and Soldiers Solve a Bee Mystery. The article detailed how some scientific researchers collaborated with Army researchers to solve the mystery of what was killing off honey bees. It turns out that the combination of a fungus and virus is proving fatal to the honey bee population. Why is the government doing bee research? While the article was interesting, it occurred to me that the story could be viewed through some very different political lenses, depending on where you sit in the increasingly polarized political spectrum. Deficit hawk could ask the question: "In an era of fiscal austerity, why is the government spending money on something as esoteric as bee research? If we wanted the government to stop wasting money, this is a perfect example of activity that government shouldn't be in." Does the Pentagon get a free pass? On the other hand, this isn't just the federal government doing esoteric research, it's a special branch of the government, i.e. the Pentagon. For some conservatives, the military gets a special pass for their activities. Is bee research one of them? Or has the military gone too far? One more step towards Argentina? Lt. Col. Milburn's comments are reminiscent of comments from the colonels of the Latin American juntas of a bygone era. At what point does the military stop getting a free pass on policy? Allowing the Army to reach into parts of civilian life where it doesn't have a traditional role, e.g. bee research, echoes the reach of the Army in other emerging market countries of today, e.g. Asia where the Army can be found in industries such as banking and real estate. Is this another step in America going south towards Argentina? This is a political Rorschach test: Your answer depends on where you are in the (increasingly polarized) political spectrum. Disclaimer: The purpose of this post is to raise questions so that you can examine your own biases. I actually don't have a strong opinion on this issue. Good investors are politically neutral and agnostic. They watch, react and capitalize on the political, economic and financial climate. I normally don't write very much about company analysis, because I have spent most of my professional life as a quant. Nevertheless, I was fortunate to have been a small cap/special situations analyst early in my career. That experience from the school of hard knocks taught me that, indeed, different industries have very different value-drivers and therefore different valuation metrics, which was a invaluable lesson for me later in my life as an equity quantitative analyst. Two recent events prompt me to write this post. Firstly, I volunteered to be a team mentor in the CFA Institutes' Global IRC Challenge, where teams from universities around the world compete by performing investment analysis. As well, I was asked to give advice to a junior company seeking a stock exchange listing on the issues of raising capital and investor relations. I therefore write this post with those two groups in mind. What is the company's competitive "moat"? Why does it exist in the first place? For example, a corner grocery store's competitive position is likely it's location - convenience is probably the main factor here. On the other hand, a company like Apple depends mainly on its technology, design and "coolness" factor - which is why customers line up overnight for new releases of iPhones. How do you value the company? Answering this question depends on how you answered the first question. What kinds of margins are sustainable in that business? If the "competitive moat" is large enough, then the company can extract above average margins and returns on capital for a long time. On the other hand, a corner grocery store in a commoditized business can only earn market rates of return, barring other competitive advantages. IMHO, way too much of the focus in business schools is on valuation. No doubt, corporate valuation modeling is a skill that need to be learned. Once learned, however, it's a highly commoditized skill and offers the analyst little or no competitive advantage over his peers. Analysts who mainly focus on building company financial models often wind up just becoming a stenographer for the company and add little new investment insight. I have found that the analysts that really stand out from the crowd are the ones who have effectively mastered the principles in Michael Porter's books Competitive Advantage and Competitive Strategy . It doesn't mean, however, that the analyst needs to do a 50 page Porter analysis of a company's competitive position, i.e. threats from suppliers, customers, existing competitors and new entrants, etc. It does mean that the analyst should be aware of these issues and flag the positives (competitive advantage) and negatives (risks) faced by the company. To give an anecdotal example, I recall researching Nokia, a darling stock during the days of the Tech Bubble. It was the American based analysts who were very good at understanding the Nokia competitive position at a top down level. The story at the time, was that Nokia had a leading market share in handsets and a valuable brand. It could therefore use its volume muscle to drive down margins for its competitors and remain dominant. On the other hand, the European based analysts who knew where all the figurative bodies were buried. They were much better at the bottom-up analysis and the channel checks. I depended on the European analysts for alerts about problems in the telecom business, e.g. relationships with major customers, production lines going down and their possible implications, etc. Both are forms of competitive analysis. One is strategic in nature and the other tactical. Both are valuable. Without both, financial modeling becomes a GIGO (garbage-in-garbage-out) exercise in fundamental analysis. I have learned over the years that my underlying investment outlook has a Value bias and that I suffer from the curse of Value investors everywhere by being too early. Often, I have found myself fighting the trend and underperforming as a result. One of the tools that I have used to mitigate that effect is to look for inflection points in sentiment and momentum. First of all, I agree with John Hussman that the US economy appears to be deteriorating (and his writes much more eloquently than I do). So far, the stock market hasn't paid much attention to those risks and is in fact probing new highs as I write this. For the first time in more than a year analysts are cutting their forecasts for Standard & Poor’s 500 Index earnings, jeopardizing gains from the biggest September rally since World War II. Estimates for S&P 500 companies’ combined 2011 profit fell as low as $95.17 last month from an August high of $96.16 and posted the first quarterly reduction since the three months ended June 2009, according to more than 8,500 analyst forecasts tracked by Bloomberg. The revision came as the benchmark gauge for U.S. equities rose 8.8 percent last month, the largest September advance since 1939. Just as the bulls appear to be taking control, I am put in the position of the robot in the old TV series Lost in Space as I warn: "Danger! Will Robinson! Danger!" A friend recently asked me my opinion about what she should do with a certain stock. This is the sort of question that I hate to answer. First of all, I knew nothing about the stock, which happened to be the shares of a junior mining company. Notwithstanding the fact that I knew nothing about it, it was also difficult to answer the question because I knew little about the rest of the portfolio. How big a position is it? Why did she buy it in the first place? Was it for diversification? Was it because she got a "hot tip"? In other words, what was the bet that she was making in the portfolio? Until an investor can answer that question, then it's impossible to know what to do with the stock. The idea behind the Fundamental Law of Active Management is to size the bets according to the edge you have. In Mandelman's case, he has an investment process that is based on intensely focused fundamental research. Under those circumstances, you want to bet where his edge is, i.e. fundamental research, and a 15 to 20 stock portfolio may not be a bad idea. On the other hand, a top-down based investment process that picks sectors or countries needs a much larger number of positions in the portfolio because you want to diversify away the individual stock bets in the portfolio but concentrate the sector or country bets. What was the bet you wanted to make? How big a bet did you want it to be? If you don't know the answer to the first question, then recall the adage about looking around a poker table to spot the chump. If you can't find him, then it's time to look in the mirror.